A mid-term assessment of where the world stands on its commitment to provide basic education for all children, youth and adults by 2015. 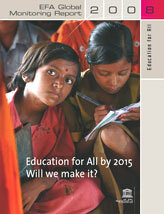 What education policies and programmes have been successful? What are the main challenges? How much aid is needed? Is aid being properly targeted?